Here are answers to some of the questions we get asked most frequently. How do we get funding from you? In the first instance do read our funding guidelines. If you feel you fit we have an on-line application form which we ask you to complete. When is your next closing date for funding applications? First week of October for our February Grants Committee. Please check our website for the exact date. Applications must be received by 1pm on the closing date. Applications received after the deadline will not be considered until the next closing date. How many years funding can we apply for? Usually over one, two or three years. How much do you give out in funding each year? We plan to spend around £8.5 million each year. How many groups do you fund each year? We fund approximately 130 groups each year. Because most of our grants are for more than one year, we are normally supporting over 300 groups at any one time. Details of the groups we fund can be found in regular updates we post on our website. You will receive an automatic acknowledgement by e-mail when you have submitted your on-line application. It is then passed to a relevant member of our grants staff who will read and assess it. Our grants team then meet and discuss all of the applications received and decide which ones have the closest fit with our funding programmes and shortlisting criteria (listed on page 13 of our funding guidelines). We’ll let you know whether we have shortlisted your application within six weeks of the closing date. Can we post, fax or email you our funding proposal? No. We only accept applications submitted via our on-line process. Unfortunately not. Neither do we fund organisations applying for grants on behalf of individuals. Do we have to be a registered charity? We fund organisations undertaking charitable work which benefits Londoners affected by poverty and inequality. You do not need to be a registered charity, though many of the organisations we fund are. If you’re unsure about whether you are eligible to apply please telephone us. We support long-term strategies for dealing with poverty and inequality. Therefore organisations that have already received funding from us may apply again for work which is particularly effective and continues to meet our criteria and funding programmes. However, you should not assume we will award further funding and should also apply to other sources. If you wish to apply again for the same or different work, you should contact your relevant officer at least six months before your current funding expires. Generally we do not provide more than one grant at a time. Do you provide feedback on why our application was rejected? Yes we do. If you are rejected we provide some feedback in our email to you. This will outline the main reasons we were unable to support your work. You may also phone us for further feedback. Our funding proposal was rejected. When can we next reapply? You have to wait 12 months from receiving your rejection e-mail before you can reapply. We’re not happy with your decision. Can we appeal? If you have any complaints about how we have handled your application, you should in the first instance contact the member of staff who has been dealing with your organisation. We’ll try to rectify any problem or misunderstanding. If you are not satisfied you should write to our Chief Executive who is responsible for the management of the Trust. If the complaint is regarding our Chief Executive, you should write to the Chair of our Trustees. However, please note that you cannot appeal any decision made by our Trustees about whether or not we fund your organisation. Any complaint you make will not jeopardise your funding application or any future application to us. The local authority recently funded us. But this funding has come to an end. Will you fund it instead? We do not pick up any funding cuts made by a local authority or any other public body. However, often the funding from the public body is time limited and not an ongoing grant/contract. We may consider continuation funding in these cases, but this is rare. Generally where a public body has provided funding we would expect it to provide some continuation funding, otherwise it is unlikely that such a project could have any medium/long-term sustainability. We do not consider funding from the national lottery as funding from a public body and are therefore more likely to consider continuation funding for projects previously funded by the lottery or which have been funded by independent charitable trusts. We already have funding to deliver a government-funded contract, but it did not include enough funding to deliver all of the outputs in the contract. Will you fund the difference? No. We do not subsidise contracts. These should be fully funded by whoever is purchasing the service and you should think carefully about all of the costs of delivering any contract before signing it. Do you fund larger organisations? Our priority is support for smaller and medium-sized organisations with an income of under £2 million. Approximately 80% of our funds go to groups with an income under this amount. We may fund larger organisations where they have a very strong fit with our funding programmes and shortlisting criteria; where the organisation plays a unique and distinctive role; and where the organisation is developing an innovative or strategic project. We are unlikely to fund large national organisations which enjoy widespread support. Our work doesn’t fit your funding programme. Should we still apply? If it does not fit please do not apply. This is not a good use of your time or ours. However, we occasionally fund work to tackle poverty and inequality which falls outside our programmes, where the work is exceptional or addressing a new and emerging need. You will need to speak to us if you wish to apply under this heading. Generally, we will only make a few grants under this category each year. Do you only fund work related to London? Yes, generally this is the case. However, some of the activities we fund have a wider national, and sometimes international significance. 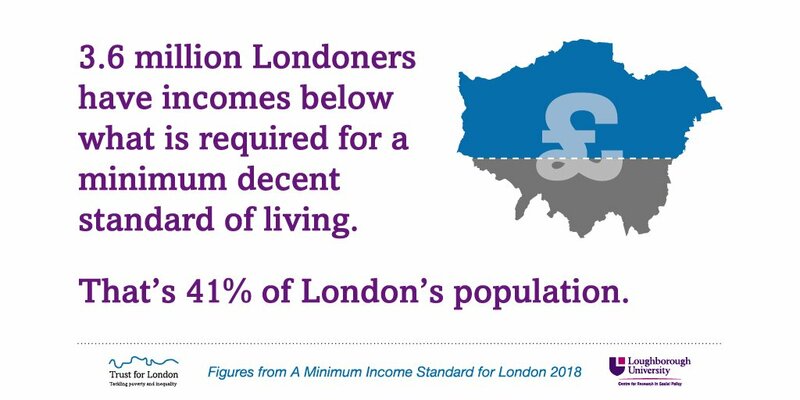 If this is the case we will contribute towards the London element of the work, as long as a significant proportion of the beneficiaries are living and working in London. For example, if you were proposing to change national policy in relation to migrants’ rights, we would consider this, as a substantial proportion of the UK’s migrant population reside in London. We could therefore consider providing some of the costs of this work. However, if you are campaigning for change on a national policy that affects people across the UK (such as domestic violence) we could consider funding a specific element of the work which focussed on London. Our legal remit is London because our funds came from a large number of legacies and donations, which were solely for the benefit of Londoners living in poverty.